In order to be effective, the hard work we put on the bike or on the mat must be balanced with recovery to reduce fatigue. 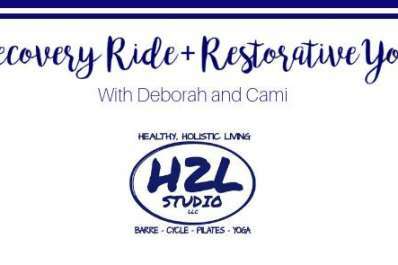 Cami and Deborah are joining forces to bring the first combo recovery ride + restorative yoga class to H2L. The class will start with a 45-minute candlelit recovery ride in the cycle room followed by 45-minutes of candlelit restorative yoga in the barre room. The cycle portion of this class focuses on a true active recovery, allowing riders of different abilities to come together and pedal it out - focusing more on form and less on the “hard work”. This class is meant to refresh you mentally as well as physically, with no pressure to perform at max. Cami will guide you through some light rolling hills and easy flats, all levels are welcome to join. After the Recovery Ride join Deborah for forty-five minutes of a Restorative-based Yoga class. The class will incorporate gentle movements and longer holds, all designed with the intention of moving you into a place of deep relaxation. This is an all levels yoga practice, and no prior yoga experience is required. The class will conclude with a guided meditation, followed by spirits and light refreshments. Cami and Deborah are excited to have this opportunity to recover, restore, and relax with you! This class is $15 and spaces are limited!